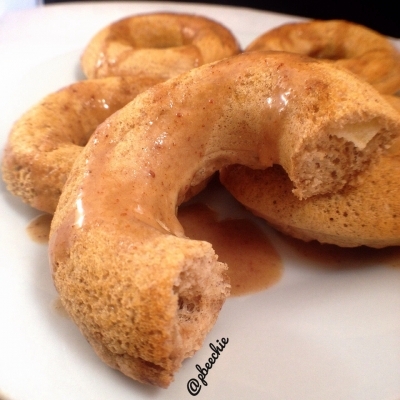 Donuts are usually a breakfast food but these feel so guilty that it's a perfect dessert! Preheat your oven to 350F. Grind 1/2 cup oats into a flour. Then add 1/2 scoop cinnamon swirl whey protein (or vanilla), 3 egg whites, 1/2 tsp baking powder, 1 tsp vanilla extract, 1/4 tsp maple extract, 1/4 tsp cinnamon, 1/8 tsp apple pie spice, and 1 stevia packet. Blend again. Chop up the 1/3 apple and swirl it into the batter. Pour the batter into a sprayed donut mold pan, making 5 donuts. Bake at 350F for 10 minutes. While thatâ€™s baking, make the glaze by mixing 3 TBSP sugar free syrup, 1/8 tsp cinnamon, and 1 TBSP cinnamon swirl whey protein (or vanilla). Once the donuts are done, drizzle on top and enjoy!